We finally have an update about Reliance Jio’s broadband services, although not officially. The company has issued a note to some of the residents in Delhi-NCR saying that they will start putting up the necessary infrastructure for ultra-high speed internet service. In the same note, Jio also confirmed that the work of laying network cables will be done within two weeks. As it was rumoured for a long time now, Reliance Jio will provide the broadband service as a preview offer at first. This note was revealed by a Journalist named Aseem Manchanda on Twitter. 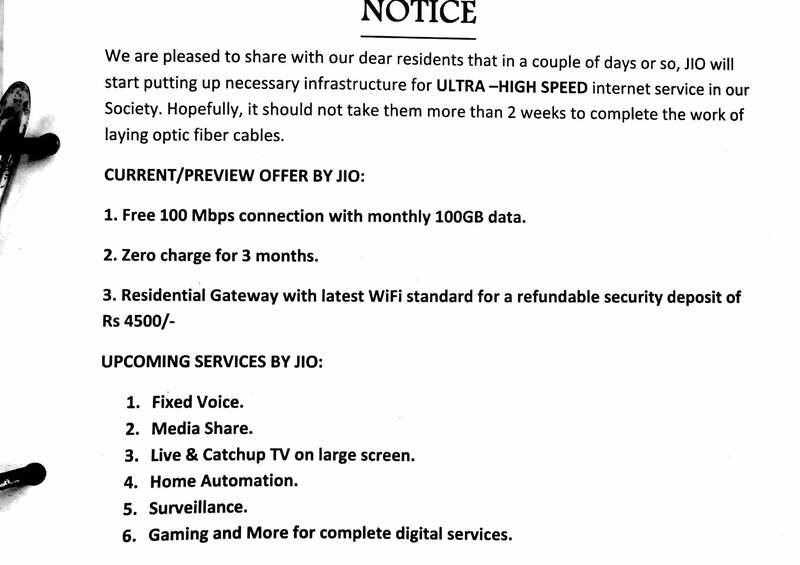 And the note also has details about the Jio Broadband Preview offer. Under the Preview offer, Jio will be giving 100 Mbps connection for free with a monthly FUP of 100GB data. And yes, the company won’t charge you anything for the first three months. However, as a security deposit, Jio will collect Rs 4,500, which is completely refundable when you’re looking to move away from the operator. Reliance Jio has done the same thing with JioPhone as well. The JioPhone is effectively priced at Rs. 0, however, Jio is collecting a fully refundable security deposit of Rs. 1,500 from every user, which will be refunded to the user after three years if he returns the JioPhone. Furthermore, the note also revealed all the upcoming services from Reliance Jio. Fixed Voice, Media Share, Live & Catchup TV on a large screen, Home Automation, Surveillance, Gaming and More for complete digital services are the upcoming services from Reliance Jio. Home Automation and Surveillance is something which Reliance Jio is said to be working for a long time. The Mukesh Ambani-led company may foray into the DTH segment as well, alongside the broadband segment. Reliance Jio DTH service has been subjected to various leaks, but the company is yet to officially announce the service. Currently, there’s no info on when Jio is planning to kickstart the broadband services in other cities. Happy with my SBB internet(Faridabad). I am getting 16 MBPS(Unlimited download and upload, no FUP) in 800 rs.